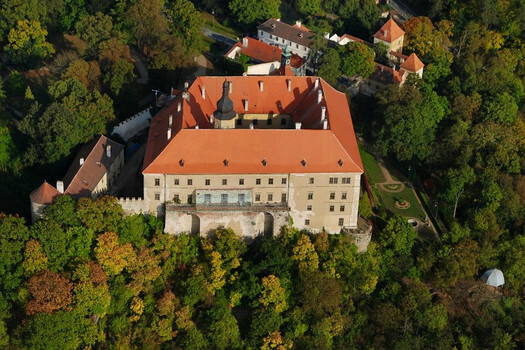 The castle of Náměšť offers the two sightseeing tours. The first sightseeing tour is represented by the castle chapel, inner arcade courtyard, castle library and the displays on the first floor. Besides the priceless baroque furniture of the chapel and the rich book stock of the castle library you have the opportunity to admire the unique display of tapestries covering the period from the first half of the 16th century to the half of the 19th century. The tapestries on display come mainly from the provenance of famous workshops in Brussels, Enghien and Gramont in the area of Belgium but also from the workshops of French Aubusson or Beuvais, which were, however, founded by Flemish weavers. Nowadays, some of the designers of cartoons - the patterns, according to which the tapestries were woven, are known. Leon van der Hecke, Francesco Casanova or the authors influenced by Rubens belong to them. The scenes on the tapestries present antique, biblical, allegorical or historical motives. The oldest piece of tapestry is represented by the verdure dominated by a composition of various plants, flowers and animals made about 1540; the youngest piece is a smaller tapestry from the beginning of the 19th century, from the end of rococo period and the beginning of historism. Besides the collection of tapestries there is a remarkable amount of the ancient furniture in the castle display covering the periods of renaissance, baroque, rococo and empire, as well as the priceless paintings from the work of Tintoretto, Veronese, Zampieri, Bernardo Bellotto-Canaletta or Jan Kupecký, or the collection of porcelain and ceramics and, as the last but not least, the unique ceramic tile stove made mainly by craftsmen from the nearby village of Mohelno. The second sightseeing tour presents former guest rooms and nurseries on the second floor, including the social premises represented by for example The Billiard Room or the dining room, where the part of the castle porcelain collection is displayed. You will see again the priceless ancient furniture so that you have the chance to imagine being in the position of the lords of the castle in the 18th and 19th century. Parks and gardens, which you can enter free, are the ideal place to relax and admire a number of valuable trees and wood species. The surroundings of the castle invite you for walks but it also offers longer routs for tourists through the former castle deer park or the picturesque valley of the Oslava river.